These fragrant muffins inspired by the flavors and ingredients of Minnesota's North Woods were a finalist in our recipe contest. The recipe comes from Cheryl Francke of Arden Hills, Minnesota. Lightly coat 6 (3 1/2-inch) jumbo muffin cups or 9 to 10 regular (2 1/2-inch) muffin cups with cooking spray; set aside. In a small bowl combine chopped cranberries and 1/4 cup of the granulated sugar; set aside. For topping: In another small bowl, combine 2 teaspoons of the orange zest, the coarse sugar and 1/4 teaspoon of the nutmeg. Set aside. In a medium bowl, combine flour, the remaining 1/4 cup granulated sugar, the baking powder, coriander, the remaining 1 teaspoon orange zest, the remaining 1/2 teaspoon nutmeg and the salt. Make a well in the flour mixture; set aside. In a large glass measuring cup, combine the orange juice with enough buttermilk to make 1/2 cup liquid. Add the beaten eggs and melted butter; whisk with a fork. Add orange juice mixture all at once to the to dry mixture; stir until combined. Gently fold in the cooked wild rice and reserved cranberry-sugar mixture. Spoon batter into prepared muffin cups. Sprinkle with topping and additional nutmeg. Bake in a 400 degrees oven for 21 to 24 minutes for jumbo muffin cups (or 15 to 18 minutes for regular muffin cups) or until a toothpick inserted in centers comes out clean and the tops of the muffins are golden. Cool in muffin cups on a wire rack for 5 minutes. Remove from muffin cups. Serve warm or cooled. * For rice: In a small saucepan bring 1 cup water to boiling; add 1/2 teaspoon salt. Slowly add 1/4 cup uncooked, rinsed wild rice and return to boiling. Reduce heat and simmer, covered, about 40 minutes or until most of the water is absorbed. Drain, if necessary; set aside to cool. Followed directions exactly, except they were done at 15 minutes in regular size muffin tins, and they are AWESOME! Not too sweet. 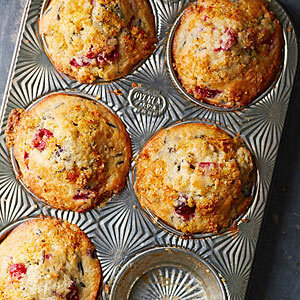 Perfect Holiday muffin with lots of flavor. This recipe is a keeper!